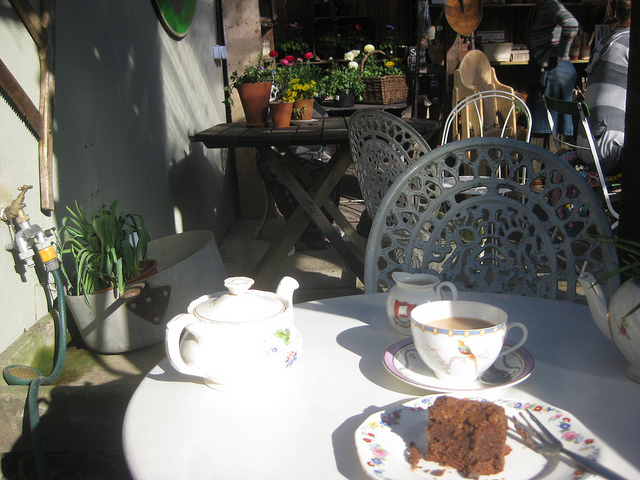 A quiet little haven on Parish Lane in Penge, Alexandra Nurseries is a garden centre, café and second hand home and garden ware shop with a lot of charm, run by landscape gardeners John and Sarah - who live next door - and at its best on the sort of warm sunny days we've been having this week. We are told that the nurseries occupies a former caretaker’s office and maintenance workshop for the Alexandra Cottages, a development of 181 homes built during the 1860s by the Metropolitan Association for Improving the Dwellings of the Industrious Classes. It's a nice spot, and even though your author doesn't have a garden of his own it was a nice place to have tea and cake among the flowers and pretend he did.